Kids are walking through their new classroom doors after having had a fabulous (or so I assume because how can summer not be fabulous?!?!) summer. 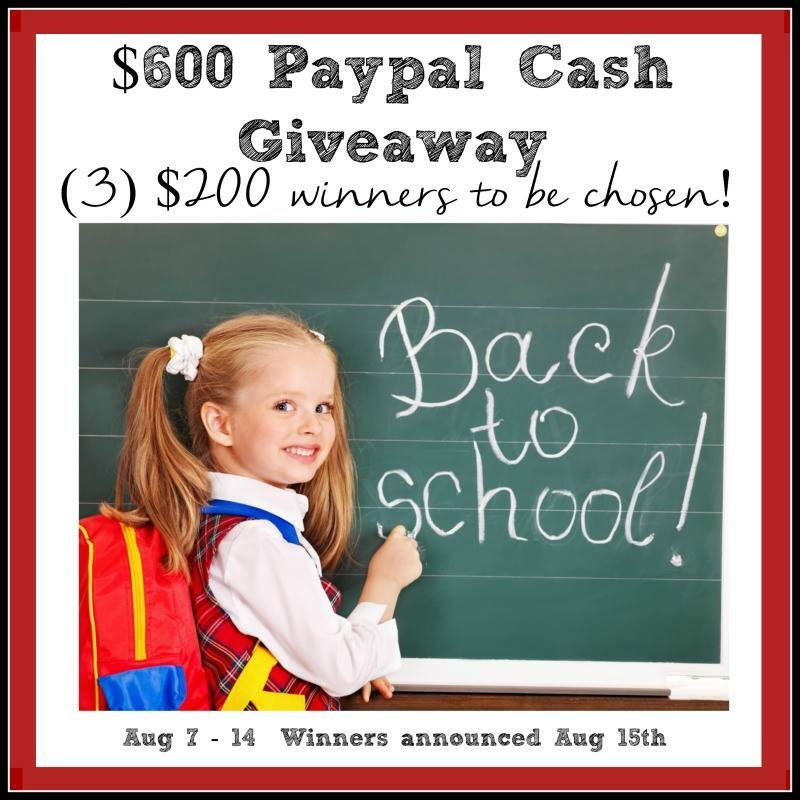 We (several of us bloggers) are giving 3 winners a chance to each win $200. You could use the money any way you want? For school clothes, supplies, last activity or outing with the kids, celebratory dinner or a spa day to help you relax before the school year gets crazy. It’s up to you! Regardless…wouldn’t it be nice to just have extra cash like that to do with what you want?!??! Well…then…what are you waiting for? Enter today! As you can see the Giveaway starts this morning at 8am and lasts until August 14th. Winners will be chosen, by Rafflecopter, on the 15th. I’ll be sure to post the winner on all social media outlets. I would like to win some money. It would be fabulous, after you enter, if you leave me a comment as to what you would do with the money? What would be your plan if you won?!? From those that respond, I will enter you into another drawing for a $20 Starbucks card. I know! It’s not much. But it would be a nice treat. Just so you know…I would use my winnings for a special outing with my sweet Emma. While I could just take her somewhere, and I do take her a lot of places, this would be a special day for us and us alone. Pedicures, lunch, movie and something sweet for her. She’s too young for me to spend too much on Back to School Clothes. That will still come in a few years. Who am I kidding…I am sure its right around the corner. Anyway…your turn! Leave a comment below if you have time. If I win, I will use it on books and craft supplies for my third-grade classroom, plus treat myself to a really comfy pair of shoes before school starts. Now that’s a good way to spend your money Mary Lou. I do think it is sad that you, as a teacher, have to spend money for supplies for your classroom. But…love that in addition…you would buy a pair of shoes. Thanks for commenting. You will have a chance not only for the rafflecopter, but as well for the Starbucks card. Maybe for school supplies or tickets to a Water Park before school starts back?? Great ideas. Thanks for stopping by and entering Amanda! Thats pretty fabulous Donna. I think that its very sad that the teachers have to use their own money. I could see that Colleen. I am sure it is much needed. I think I could use one of those and I just had a family vacation in July. Ha! Have a great rest of the week and I hope this weekend is a little more calm for you. My kids need new sets of uniform. They have grown up a lot during the summer that their old uniforms have become too small for them. I guess our kids do that…grow up and out of their clothes. Well I wish you luck. Will post the winner on my FB page and update this post. Thank you for entering and commenting. Have a great week. Thats great Jess. I hate that our teachers today have to buy most of their own supplies. Good luck to him this year. I would pay a few bills and then send gifts to my son and my brand new nephew. Fabulous Christina. Thank you so much for entering and stopping by the blog.